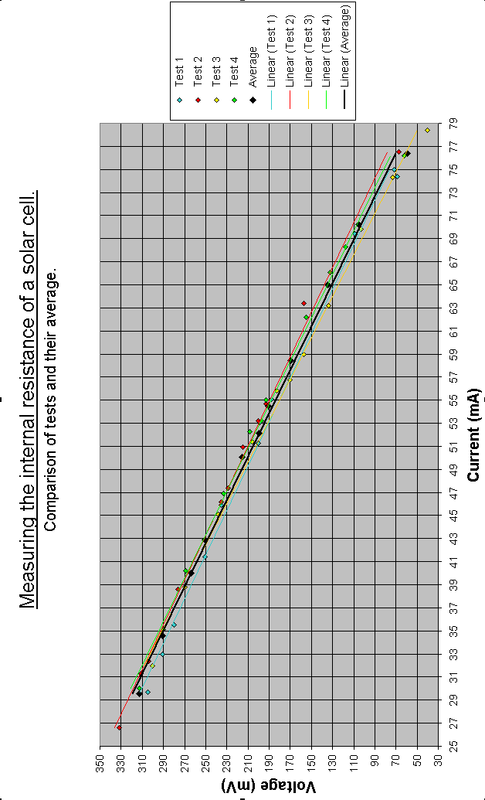 Finding the internal resistance of a solar cell. Aims: I intend to create an experiment which will measure the internal resistance of a solar cell. 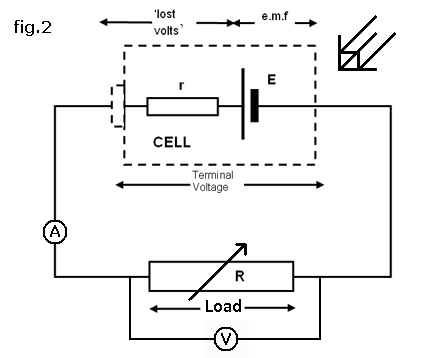 To do this I will create a circuit which will measure the current and voltage of the external circuit ‘the load’ which will enable me to calculate the internal resistance of the solar cell (fig.1). Internal resistance is the resistance within the cell, symbol ‘r’ as shown in fig.1 below. I will use a permanent light source, this will be a lamp. I have also decided to use a tube of black card fixed around the head of the lamp that goes to the solar cell. This should stop most background light from affect any results. Safety: There are safety implications when caring out this experiment. Before the experiment begins the experimental area must be clear. This involves making sure that there are no bags or coats left near experimental areas as accidents may occur. During the experiment the permanent light source may be on for long periods of time which will cause the bulb and its casing to heat up. This may cause burns and should therefore be avoided. The low voltages and currents used in the circuit pose no potential to shock or burn anyone who touches the circuit although it is advisable not to touch any apparatus for the purpose of preservation of consistency for the experiment. Variables: During this experiment I have noticed that there will be conditions that are variable and conditions that are not variable. Considerations of these conditions must be made. The conditions which must remain constant are the amount of light energy which the solar cell receives as this may affect the internal resistance of itself so must remain constant as to not affect the results. This can be solved by making sure a constant light source such as a lamp remains at a set distance from the solar cell. The solar cell used must remain constant as different solar cells may have varying internal resistances. This can be solved just by making sure that during all tests the solar cell used is always the same one. The wires must stay constant as variation of these wires may affect results of the experiment. This is not a problem as long as the same wires are used throughout the experiment. The condition that will be being varied is the resistance of the variable resistor as the name suggest it will have its resistance varied as this is part of the experimental procedure. 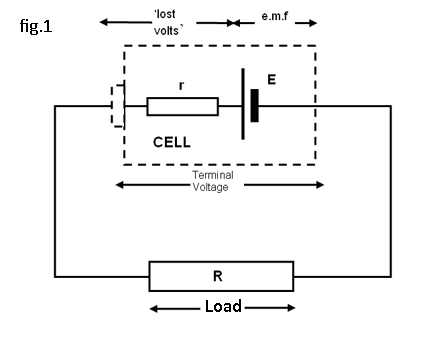 This is because as the resistance of the load changes the voltage and current of the circuit change but the internal resistance doesn’t so the precision of the experiment will be increased because of the increased range of readings. The temperature of the room in which the experiment takes place can affect the results of the experiment although are so minute that there are not worth trying to combat or account for. Measurements: When carrying out this experiment I will be recording the current using an ammeter and the voltage using a voltmeter. 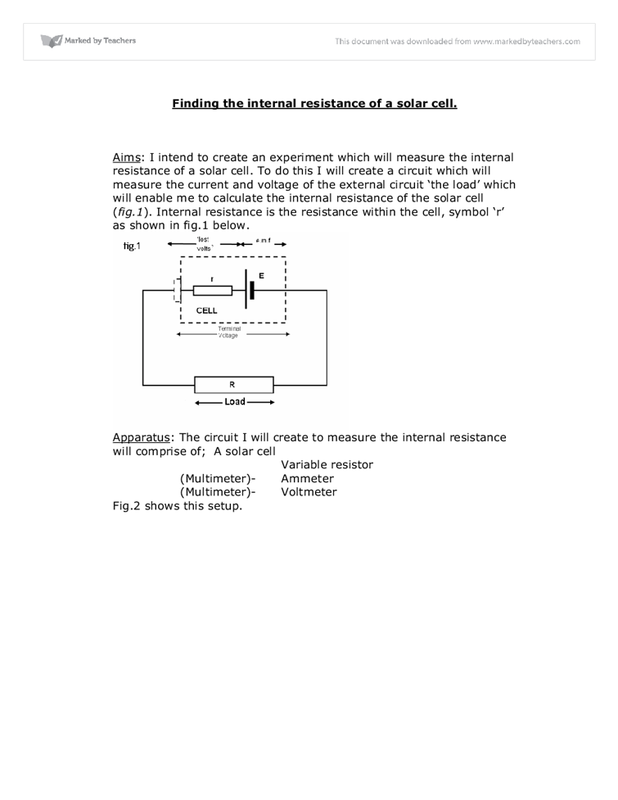 This is all the information needed to find the internal resistance of the solar cell. This is because you can find the internal resistance by using the equation E=V+Ir. This can be rearranged into a formula which has a structure similar to that of a straight line graph, V=-rI+E. This can therefore be modelled on a graph(fig.3). Consideration must be taken over deciding how many measurement must be taken and over what range. To increase the precision of the experiment I will use the biggest range available. To gain the biggest range I will use a variable resistor. I have decided to take 10 measurements of the voltage and the current as I believe this an appropriated amount, enough to improve precision but not to many to squander time. 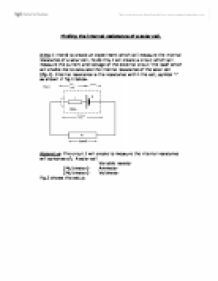 Method: To obtain the voltage and current readings required to find the internal resistance of the solar cell a procedure must be followed. Clear tables of bags and coats as to safely prepare experimental area for experiment. Collect apparatus and set out as explained before on experimental area. Set variable resistor to measurement number 1 and turn on light. Record the voltage and current displayed on the multimeters. Complete stages 3-5 for each measurement number(10). Complete stages 3-6 for each test(4) comprising of 10 measurement numbers. Once the procedure has been completed return apparatus although is advisable to leave lamp to cool before returning as may still be hot. Measurement number is the number of which a measurement is taken, a point on the variable resistor different to all others (per test). As this doesn’t require a value it is allocated a number. Sensitivity, precision and accuracy: To increase precision I will try to reduce random errors. This can easily be done by using averaging techniques, as stated before by doing repeat readings. To increase accuracy I will try to reduce systematic errors. This can easily be done by eliminating errors such as making sure the equipment is set to zero before beginning and using a light shield to cut down background light as stated before. Another error which would increase accuracy if reduced is parallax error, this cannot be counteracted as the ammeter and voltmeter being used are on a multimeter which has a digital display. To increase the sensitivity I have decided to use the multimeter as the multimeter has variable settings to match the maximum sensitivity for the values of both variables. During a preliminary experiment it was found that the multimeter values actually alter slightly as the device has such an excellent sensitivity. Analysing results: To analyse my results I will first create the graph as stated before. This should show any anomalous results as they will appear separate from the line of best fit. To analyse these anomalous result at a more complex level I will implement statistical techniques. The statistical technique of finding the product moment correlation coefficient can be implemented. This will calculate the correlation between the current and the voltage. The statistical technique of finding the standard deviation of the gradients can be implemented. It ranges from 0 to infinite. The lower the value of standard deviation the higher the degree of consistency, the closer the values are to each other. A very high degree of consistency can be described as having a standard deviation of less than 1. Before beginning the experiment I created tables which were efficiently constructed and arranged orderly and therefore aided the process of recording the data. Methodical recording of the results helps to show the anomalous results before even being put into a graph. When recording the data the units must be recorded as well. The units chosen were that of highest sensitivity that the instruments could measure to. The units used were mV and mA. The number of results taken should be suitable. The number of results taken were 4 sets of 10 results, suitable although may seem excessive. The 10 results cover the large range successfully and the repeat results are required to increase the precision. 4 results may seem excessive although I have chosen this number of repeats based on a preliminary experiment where 4 repeats where chosen as the equilibrium between time and precision. 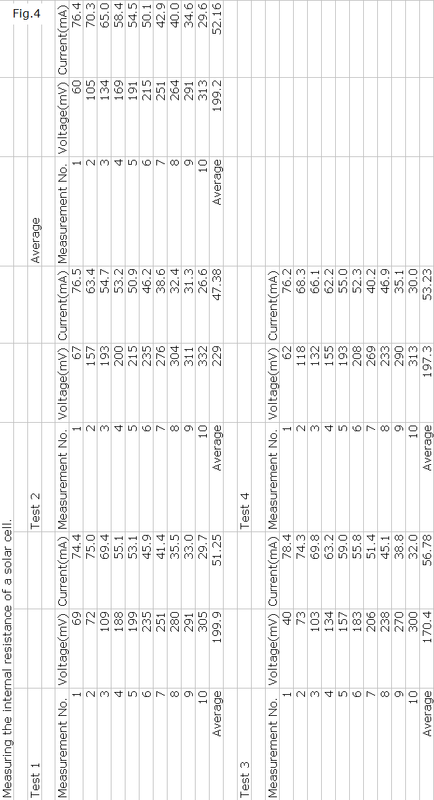 Fig.4 shows the table of results for the experiment and the calculated average of all the tests. Using the gradients of the lines of best fit I can calculate the standard deviation from the mean of the results. This shows that the gradients have a very high degree of consistency which means the gradients of the graphs are all very similar indicating accurate results. To analyse the results of the experiment further I am using the statistical method of product moment correlation coefficient to calculate the correlation between the current and the voltage. This is a good way of checking how close all the points on the graph are to the line of best fit. As explained before the closer to -1 or 1 it is the better the results are. These results show that all the tests and the average of the tests have very strong negative correlation. Using the product moment correlation coefficient of the tests and the average I can calculate the standard deviation from the mean of the results. This value shows that all the tests and the average have very close correlation indicating a high level of accuracy. The currents (amps) is independent because we control/ adjusting it from the rheostat Dependent variables * Voltage (symbol V) The voltage is gained after adjusting the currents from the rheostat that is why we called it dependent variable in this case. 8. Using the recorded ohm readings for each temperature calculate the ampage, bearing in mind that the voltage supplies in the circuit is always 9V (supplied by the multi-meter). 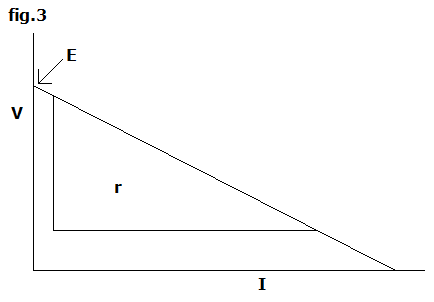 Calculate the ampage using the formula: I = V / R or I = 9 / R (where I= the ampage, V = the ampage and R = the resistance). the wires of the circuit, but this could increase if the power supply was switched on continuously for a long period of time. Measurements and Readings That Will Be Taken: I will measure the length of the metal rail and split the length into eight different sections. The bulb watt - this would have to be kept constant, i.e. if I use double the watt of the bulb that double the photons will hit the solar cell. 6. The card - If this is change, than this could affect the number if photons which hit the solar cell. From Kirchhoff's second law we know that: E = IR + Ir (1) Where E is the Electromotive Force (EMF) of the power supply, maximum energy per unit charge that the power supply can deliver. R is the external (load) resistance. And I is the current flowing through the circuit.